About 15 years ago I discovered an exceptional documentary called, The Fog of War: Eleven Lessons from the Life of Robert S. McNamara. Directed by Errol Morris, "The Fog of War" walks the viewer through most of the 20th century as told by former U.S. Secretary of Defense and World Bank President, Robert S. McNamara. Mr. McNamara reflects on his life's lessons and uses the Eliot quote above, at a particularly moving stage of the film. His heartfelt and detailed ruminations, the film clips, music by Phillip Glass and still photos all work together to vividly and memorably capture the American experience. "The Fog of War" was an Academy Award Winner for best documentary feature in 2003 and I'll recommend the film for the rest of my days. In the meantime, may you know this Christmas season as fondly as the one you knew for the first time. 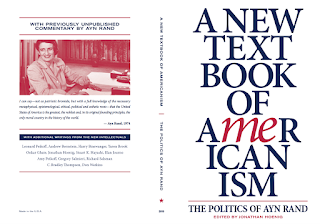 This coming November, Capitalist Pig Hedge Fund manager and business media figure, Jonathan Hoenig will release A New Textbook of Americanism: The Politics of Ayn Rand. The book, edited by Mr. Hoenig, contains a collection of essays from notable writers in the Objectivist school, including one from Mr. Hoenig himself ("On Property Rights"). Somehow I missed this local news article about two years ago on the 72nd anniversary of D-Day. The details of a D-Day jump with the 82nd Airborne Division (and subsequent trip back to Normandy 72 years later) is told in this Milwaukee Journal Sentinel article by Meg Jones. Yesterday, I met the gentleman who was the subject of that piece, Mr. Ralph Ticcioni of New Berlin, Wisconsin. (Disclosure: Ralph is Uncle to one of my brothers-in-law). As I listened to the 95 year old veteran speak about his experience, I marveled at his deep humility. As a paratrooper that fateful day, Ralph along with thousands of his comrades were dropped behind enemy lines. Unlike his comrades, he landed smack onto a farm rooftop in Cherbourg, France whereupon he had to cut himself loose from his own parachute which was entangled on a weather vane. Some history readers and viewers of the movie, Saving Private Ryan will recall that Cherbourg was a location of importance during the invasion. Speaking of the movie, Ralph told me that when he viewed the first twenty minutes of the film; he thought he was watching an actual news reel of the event. (Many D-Day veterans have expressed a similar reaction to that segment). Ralph could easily recall the gear he carried that day, including the amount of ammunition and all the weapons he was issued which included a sidearm (.45 caliber semiautomatic pistol), several hand grenades and a Thompson sub-machine gun (which was swapped for an M1 Carbine rifle after paratroopers reunited with American supply units). So pleased to have met this man yesterday. To all like him, living or not, God bless and thank you for defending freedom! Below is a humble cocktail napkin from a recent flight. The inscription -- which I failed to notice at first -- has a richer significance. Laura and Mr. Weingarten appeared to know one another rather well. 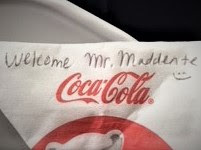 When Laura left to serve other passengers, Mr. Weingarten pointed out that both of our napkins contained this friendly, hand-written, greeting and that she had produced one for him on a previous flight. What I learned next was my inspiration for this post. Mr. Weingarten explained that on a previous flight, two other flight attendants took notice of Laura's gracious attitude toward her customers and criticized her napkin gesture (not knowing they were within earshot of Mr. Weingarten) because it made them look deficient. Shortly after Laura's colleagues finished upbraiding her, Mr. Weingarten motioned Laura to come over for a private word which he concluded with this counsel... "Don't let them crush your spirit". The story continues. 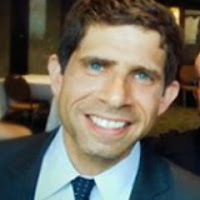 A busy executive who travels over 150 days per year, Mr. Weingarten found a portal the airline uses to garner customer feedback. He supplied his flight details and Laura's real name in order to extol her exemplary service and attitude. Airline managements take these passenger inputs quite seriously. Laura was commended as a result. I know not whether the other two attendants were cited in Mr. Weingarten's message, but this post is dedicated to all the Laura-types in our midst. Don't let them crush your spirit. Restaurants matter! I’ve harbored an almost religious attraction to places serving tasty Chinese food, Italian food, steaks, etc. since childhood. Now in my 50s I’m speaking out against a form of dining that started to proliferate across the U.S. about 10 years ago. After eying a group of baby plates spewed across a table that's invariably too small to accommodate them -- I’m drawn to some of these gastronomic strip teases more than others. Now -- how many pieces of the great stuff shall I eat? I want to be mindful of my fellow diners, but if I ignore the less appetizing small plate items I'll leave hungry. Wait, did he order those marinated artichokes as his main dish? OK, how many small plates shall we order for the next round? One? Two? Twenty? Who votes for which plates to order? You going to finish those artichokes? I hear a sharp rebuke coming from Small Plate devotees, “Just order more small plates that you like, Bozo and don't sweat the rest!” No. Thanks for the appetizers, but I’ll go elsewhere to enjoy an entrée in simple, adult-plate bliss. Warren Buffet and Carl Icahn are familiar investors. 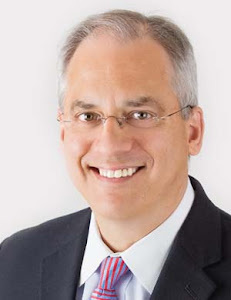 Fewer people may know Ray Dalio. Mr. Dalio founded an investment firm 40 years ago called Bridgewater Associates. With $160 billion under management, Bridgewater runs one of the largest hedge funds in the world. I recently discovered (after about 3 million other people) a thirty minute YouTube video that Mr. Dalio produced to explain fundamentals of what he refers to as the economic machine. This video, which he narrates, has been translated into several languages and viewed over 3,200,000 times. The content begins slowly with concepts that could be embraced by most eighth graders, but progresses to explain the primary levers that policy-makers use to manage and stimulate the economy. You can find it here. There are numerous lessons cleverly and clearly explained here. Example: I hadn't appreciated why economists seem obsessed with Wage Growth until I watched this simple animated video. (The importance of wage growth has less to do with the oft-used and sometimes politically-charged phrase, "income inequality" and more to do with the masses ability to consume and thus deflate credit bubbles). Also, you may come away thinking differently about the notion of Credit, which Mr. Dalio asserts, "...is the most important part of the economy and probably the least understood". Finally, what Mr. Dalio refers to as a "beautiful deleveraging" is the type of soft landing we all pray for to avert the "social disorder" some have worried about for years. The antidote, according to Mr. Dalio, is for policy makers to apply the correct mix and emphasis to each of the four economic forces illustrated below. Spending cuts, are generally what people think of when they hear about "austerity" measures exercised by government, individuals and businesses, to lower spending on goods and services. The image second from the left refers to a combination of debt defaults and debt restructuring by and between banks, businesses and individuals. Wealth redistribution occurs primarily through higher taxation on upper income Americans. Finally, the money-printing image refers to Federal Reserve purchases of government bonds and other financial assets ($2T since the Great Recession). So what's the correct mix and emphasis of lever-pulling required for a soft landing? Perhaps a more prescriptive video from Mr. Dalio, to address that question will appear on this same platform at http://www.economicprinciples.org.